Kathleen Delaney in her new book, “ Murder by Syllabub” Book Five in the Ellen McKenzie Mystery series published by Camel Press gives us another mystery with Ellen McKenzie. From the back cover: A ghost in Colonial dress has been wreaking havoc at an old plantation house in Virginia. The house is owned by Elizabeth Smithwood, the best friend of Ellen McKenzie’s Aunt Mary. Mary is determined to fly to the rescue, and Ellen has no choice but to leave her real estate business and new husband to accompany her. Who else will keep the old girl out of trouble? When Ellen and Aunt Mary arrive, they find that Elizabeth’s “house” comprises three sprawling buildings containing all manner of secret entrances and passages, not to mention slave cabins. But who owns what and who owned whom? After Monty—the so-called ghost and stepson of Elizabeth’s dead husband—turns up dead in Elizabeth’s house, suspicion falls on her. Especially when the cause of death is a poisoned glass of syllabub taken from a batch of the sweet, creamy after-dinner drink sitting in Elizabeth’s refrigerator. Monty had enemies to spare. Why was he roaming the old house? What was he searching for? To find the truth, Ellen and her Aunt Mary will have to do much more than rummage through stacks of old crates; they will have to expose two hundred years of grudges and vendettas. The spirits they disturb are far deadlier than the one who brought them to Virginia. Murder by Syllabub is the fifth book of the Ellen McKenzie Mystery series. Any story that has a Civil War era plantation in Virginia and a poisoned dessert drink sounds like a winner. And Kathleen Delaney has batted in a home run. Jessica Fletcher from the “Murder, She Wrote” Television series, as good as she was, was never as good as Ellen McKenzie is. Ellen is up against 100 years of Southern history as she weeds through the motives the various individuals have for the murder and there are plenty of suspects and there is also the cooking. 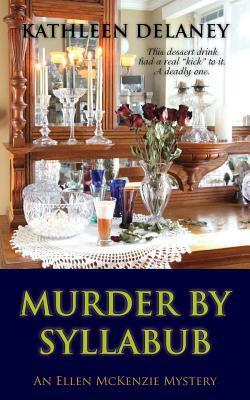 “Murder by Syllabub” is a wonderful thriller as the tension mounts as Ellen is trying to identify the killer. “Murder by Syllabub” is loaded with twists and turns and red herrings that will leave you guessing all the while you are flipping pages to find out what happens next. Ms. Delaney has provided us with a great character in Ellen McKenzie and I am going to go and get the previous four books to hold me over until the next book in this series comes out. This sounds like a fantastic read. Your review is superb and because of it, this book moved up in my TBR pile. Thank you for sharing your opinion of this title.